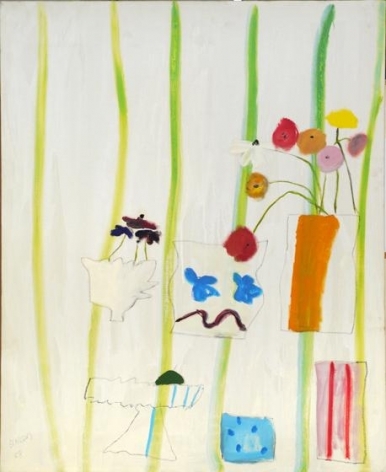 Sundaram Tagore Gallery is pleased to announce a landmark retrospective of work by Edith Schloss (1919-2011), one of America’s great expatriate artists whose paintings, assemblages, collages, watercolors and drawings border on the bittersweet, fragile, intimate and naive. Intrinsically linked to the milieu of postwar American art, every aspect of the artist’s eccentric personal iconography will be on view. This is the first show of the artist’s work in New York in twenty-five years. Curated by Jason Andrew and organized in collaboration with the Brooklyn-based nonprofit arts organization Norte Maar, this exhibition represents the most comprehensive showing of the artist’s work, offering examples from throughout her career beginning with still lifes of the 1950s and scenes of Penobscot Bay in Maine, to seascapes from her beloved studio in Lerici, Italy, and to the mythological abstractions she painted up until her death. 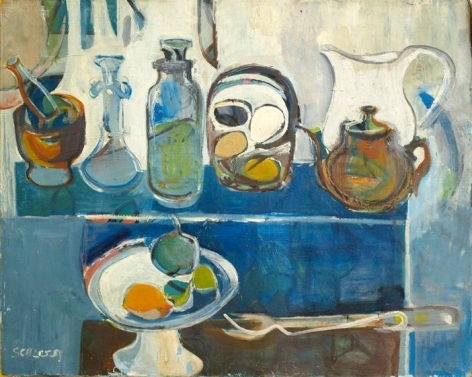 The exhibition also includes a gallery dedicated to Schloss's friends and acquaintances, with work by Ellen Auerbach, Nell Blaine, Rudy Burckhardt, Joseph Cornell, Alberto Giacometti, Willem de Kooning, Helen DeMott, Rackstraw Downes, Philip Pearlstein, Yvonne Jacquette, Fairfield Porter, Robert Rauschenberg, Larry Rivers, Cy Twombly, Jack Tworkov and Francesca Woodman among others. Edith Schloss is best known for knowing “everyone who counted in Manhattan’s legendary postwar art scene.” From the moment she was first introduced to Willem de Kooning by her friend Fairfield Porter, she became an integral member of the Chelsea-New York art scene, which flourished around the New York School and included photographer and filmmaker Rudy Burckhardt (whom she married in 1947) and the Jane Street Group around Nell Blaine. Born in Offenbach, Germany, Schloss studied languages and art as a young student. In Florence she learned about the Renaissance and in Frankfurt she saw her first Van Gogh. In London, while working as an au pair, she learned English and was inspired by the great Greek sculptures at the British Museum, which also reinforced her dream to become an archeologist. During the London Blitz, Schloss sailed to America in a convoy. Arriving in New York she met the political refugee Heinz Langerhans, who introduced her to Bertolt Brecht, prominent Communist Ruth Fischer and others. She listened to lectures by American pragmatists such as John Dewey at The Cooper Union and other great thinkers at The New School for Social Research. There never seemed to be a moment when she didn’t consider herself an artist. “Somehow I always drew, made pictures,” she wrote. From 1942 to 1946, she studied at the Art Students League of New York with Will Barnet, Harry Sternberg and Morris Kantor. In 1945 Schloss met Willem de Kooning through painter Fairfield Porter. It was a turning point. In turn she met the poet Edwin Denby, the photographers Ellen and Walter Auerbach and the filmmaker Rudy Burchkhardt. Elaine de Kooning became a staunch ally. “I happily absorbed the Chelsea climate apart from politics,” she wrote, “and I’ve settled down to paint for painting.” And she settled into loft living on West 21st Street. Around the same time Schloss met painter Nell Blaine. Together they spent “long winter nights listening to bebop records” and raced uptown and downtown “listening to Dizzy Gillespie, Charlie Parker, Lester Young and Miles Davis in person.” Schloss liked jazz for its “intuitive purity and improvisation,” qualities that became important elements in her maturing work. 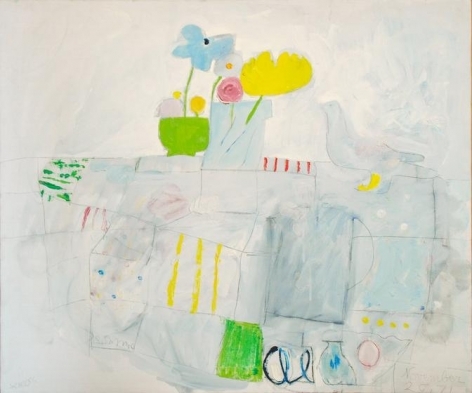 She joined the Jane Street Group, New York’s first artist cooperative gallery founded by Blaine, Hyde Solomon, Leland Bell, Louisa Matthiasdottir, Albert Kresch and Judith Rothschild. 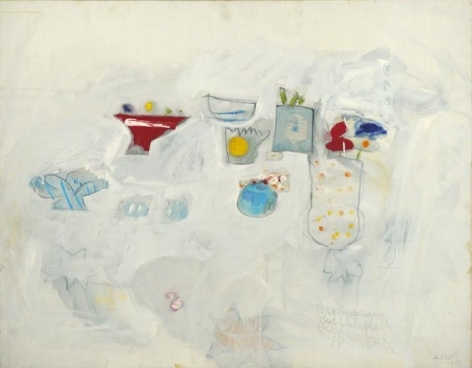 In 1947, her first one-person show opened at the Ashby Gallery. In 1947, Schloss married Rudy Burckhardt and the couple set off to tour Europe where they met Jean Arp, Meret Oppenheim, and briefly Giacometti, Brancusi and Max Bill. Upon their return to New York, she exhibited with the Pyramid Group and American Abstract Artists. Summers were spent with Fairfield Porter and his family on Great Spruce Head Island, Maine. 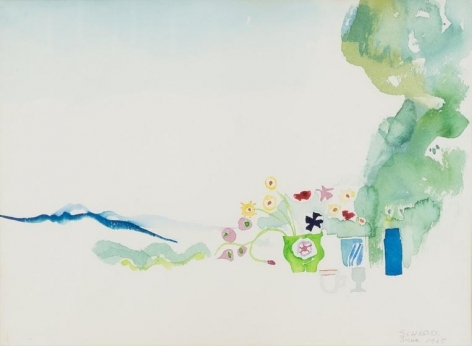 This retrospective includes watercolors exploring the summers on the bays and shores of Maine. In 1949, her son, Jacob, was born. 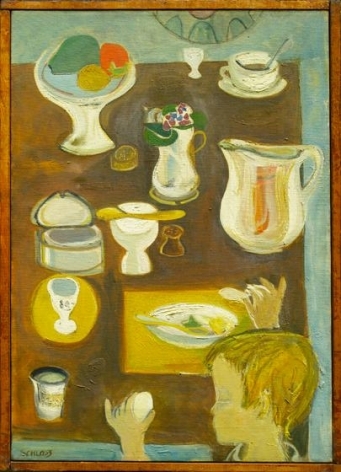 One of the first paintings in the retrospective, Egg Eater (c. 1952), features a bird’s-eye view of a young Jacob standing before a breakfast table set with a scattering of white antique dishes including a bowl of fruit. It’s a naive painting with historical references yet the versatility of the composition demonstrates modern, avant-garde ideas. 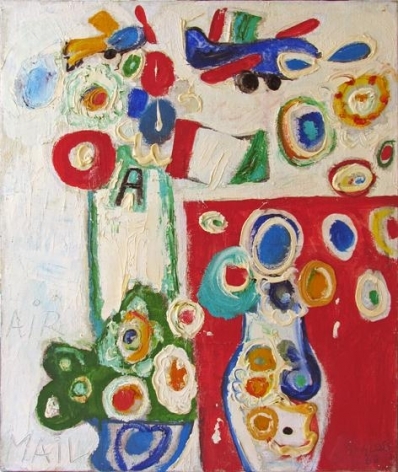 As Abstract Expressionism took hold in New York and action painting grew more dogmatic, Schloss set aside her figurative intensions and turned to collage and assemblage “because it was in an avant-garde technique it was considered alright by the abstractionists.” Assemblage bridged her interest in writing and art and for a time, she become better known for her boxes than for her paintings. In 1961, she was included in The Museum of Modern Art’s landmark exhibition The Art of Assemblage. These boxes housed the precious things she found on beaches and on walks through the city. Sailor or Countryman (1962) is a small cupboard containing rocks, a wood carving of a boat, and a sea horse. 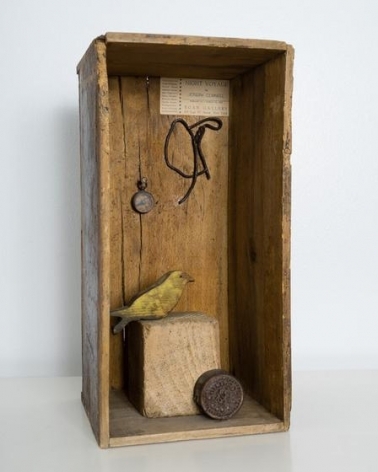 Night Voyage: Homage to Joseph Cornell (c. 1962) is the perfect tribute to Edith’s friend, complete with a collaged gallery label from Cornell’s exhibition at the Charles Egan Gallery in the early 1950s. 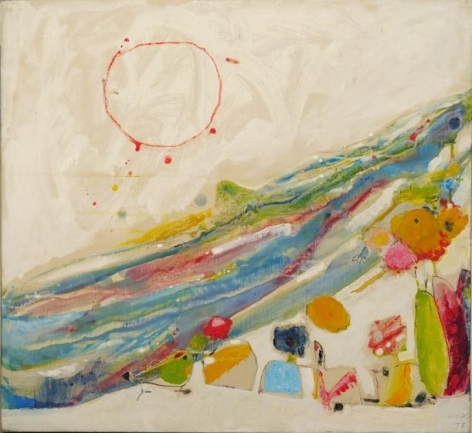 Over the years she exhibited in New York at the Tanager Gallery, Green Mountain Gallery and Ingber Gallery. In 1962, with her marriage to Rudy growing strained, she left for Italy with the intent of staying three months. She stayed for a lifetime. There she met Giorgio Morandi in his summer home in the mountains above Bologna. Cy Twombly became a neighbor and close friend and the American experimental composer Alvin Curran became her lover. She drew inspiration from Etruria and Magna Graecia and later the caves of the Sahara. 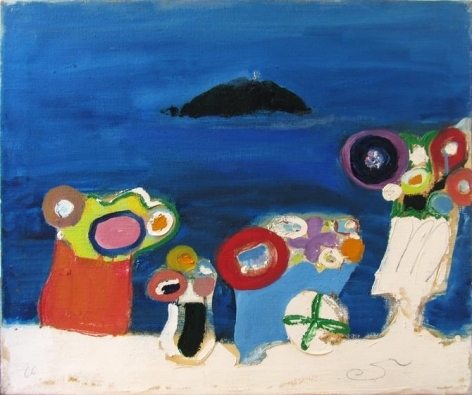 In 1964, she opened her first exhibition at the Galleria Aleph in Rome, followed by many others throughout Italy over the years. Schloss’s passion for the paintbrush was only matched by her passion for the pen. As she settled into her new life in Rome, she returned to writing art criticism (during the 1950s she was an editorial assistant at Art News). She became the leading cultural voice in Italy as art editor for the International Herald Tribune from 1968 to 1986. Later she wrote regularly for Wanted in Rome. Her keen eye, not only for the historic but also the contemporary, led her to be one of the first to write about Jean-Michel Basquiat and Francesca Woodman, among others. In addition to her critical writings, she published books of her poetry, authored and illustrated children’s books, and created set designs and record covers for Alvin Curran. In the late 1970s, Schloss introduced a figure, a single diver based on one in a tomb in Paestum. “I added swimmers, falling or striving bodies, somehow playing the myths of pursuits and surrender.” These figures gave Schloss an enhanced narrative and she painted them as lovers, warriors, heroes and gods. They became the trademark of her late work. Agon (2000), Eros: Elio + Helios (2001), Danae (2008) are all gestural paintings celebrated for their myth, their vitality and their spontaneity. “They tell of giving death and making life.” Leda (2011) is the first painting from the last series Edith painted before she died. Schloss’s work can be found in prominent private collections in New York, London, Paris, Berlin, Frankfurt, Tokyo, Sydney, Rome, Milan, Ferrara and La Spezia. Her work is represented in the public collections of The Metropolitan Museum of Art, New York; the Keats-Shelley House, Rome; and the Hessisches Landesmuseum, Wiesbaden and the Offenbacher Stadtmuseum, Offenbach, Germany, to name a few. 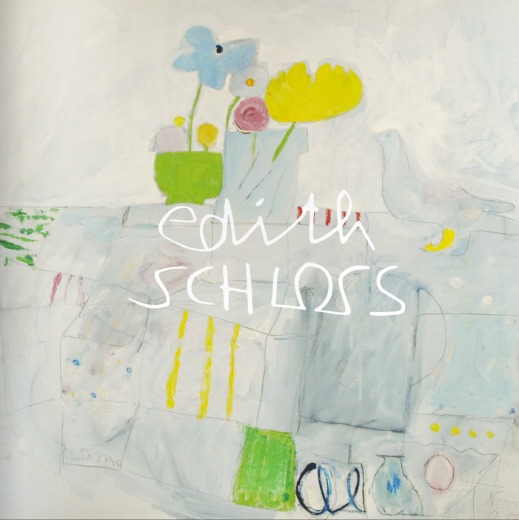 Exhibition curator Jason Andrew will talk about Edith Schloss and the exhibition at the Art Students League of New York Tuesday, February 10, 7 to 8:30 pm. Click here for information. For more information on the exhibition, email gallery@sundaramtagore.com or call 212-677-4520.